Versatility meets luxury to create one of the best pet products on the market. 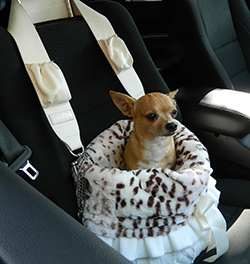 This single item acts as a car seat, pet bed, carrier bag and more. Made with the finest in luxury fabrics, soft doesn't even do justice for the cloud of comfort provided for your pet. This reversible Snuggle Bug is machine washable, lightweight and fashion forward. It comes with a matching blanket and cushion for additional comfort. Be sure that your pet has the best with our Snuggle Bugs. The Snuggle Bug measures approximately 12" x 16" on the interior. It has a height of 10". Designed for pets 15 lbs and under.